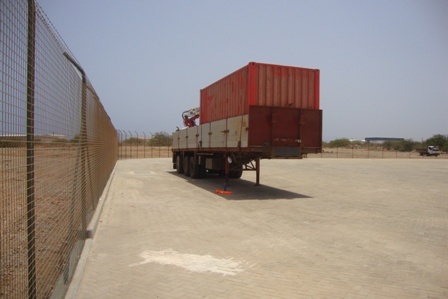 Shipping of goods and produce between the Cape Verde islands is something the local people do on a regular basis. 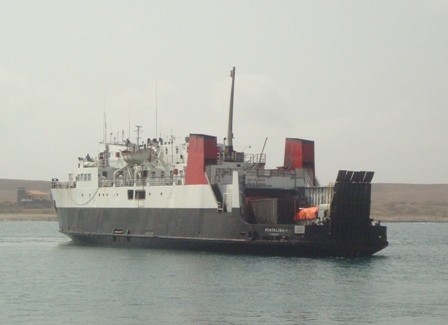 Businesses use this form of transport to send goods between islands cheaply. Families travel back and forth between the islands on these boats. The boats take much longer to arrive at a destination than a plane, hence why they are a much cheaper form of travel. 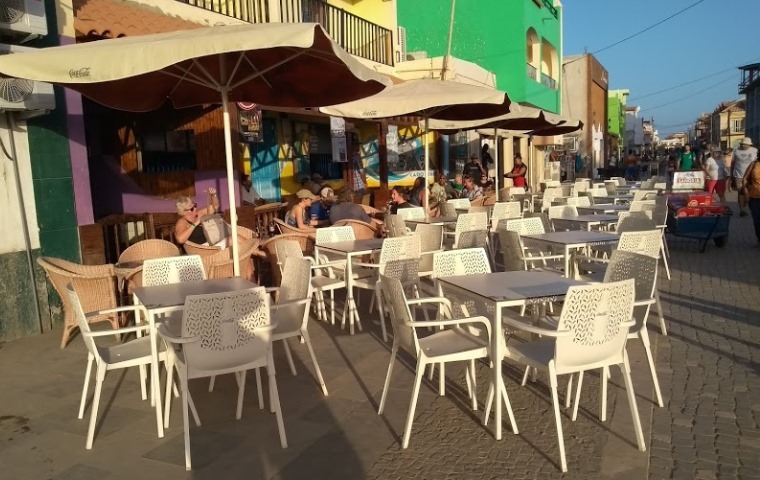 I'd gone to the port at Palmeira on Sal Island on Saturday morning with someone who'd arranged to have fresh produce shipped over from Santo Antao to Sal via Sao Vicente for the first time, so it was a new experience for both of us. We were informed the boat was due in around 9a.m. 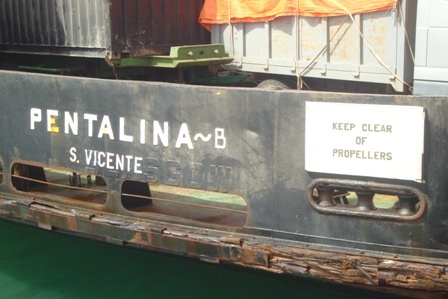 I am not sure how and when the produce was transported to the port at Port Novo on Santo Antao and placed on the ferry to send over to Sao Vicente. 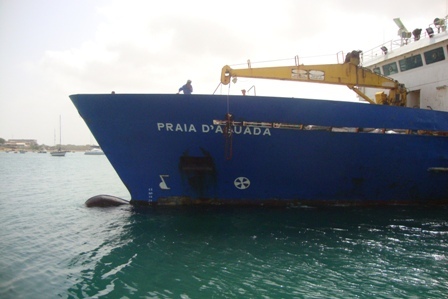 It would have to have been unloaded off the boat on Sao Vicente then re-loaded onto another boat that was due to depart for Sal on the Friday evening. It may have been carried out on the same day, on the Friday morning or Friday afternoon as the boat leaving for Sal we think was due to leave at 6p.m. and it would take some 15hrs to reach Sal, stopping on Boavista on the way. 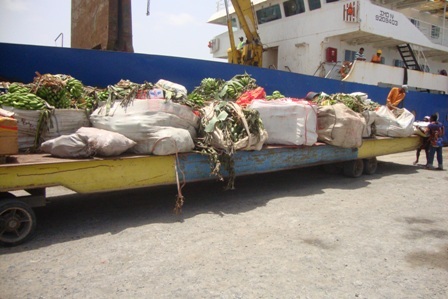 It is important to make sure that fresh produce is packed correctly and if possible loaded last, this should ensure that they arrive reasonably fresh and undamaged at its destination. It’s also good to have someone making sure that produce is of a good quality, deal with the paperwork and see that the produce is unloaded and loaded at its departure and arrival destination. We first went to the main gate at Enapor. We did not have any paperwork, which it would have been better to have. We were told to go into the main waiting area. 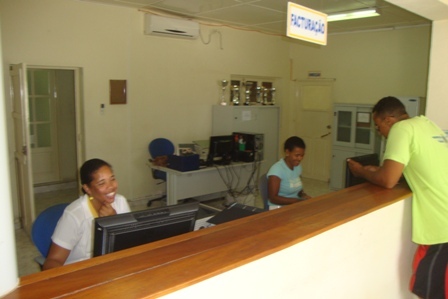 The staff at the port do not speak English, but we managed, with a bit of Creole, Italian and with the help of a Cape Verdean who had lived in the States who spoke good English, who was there waiting for the boat from Praia to arrive. 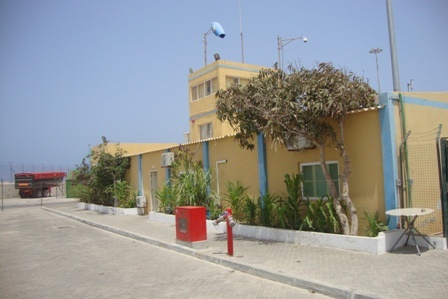 On approaching the staff inside, we were firstly informed there was no boat arriving from Sao Vicente, only one from Praia (Santiago), then he said it would arriving after 3p.m.. We said we were told it was due in at 9a.m. 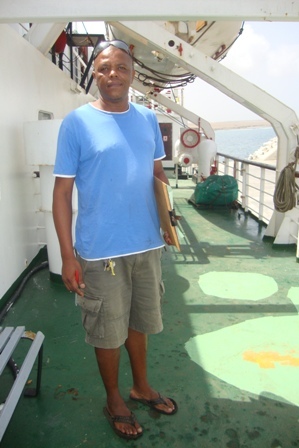 as we had cargo on the boat, he then he asked someone else who told him it was due in at 10a.m. So we went back outside to get a drink at the little Kiosk just outside the main gate. 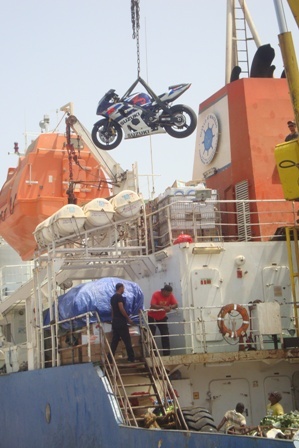 NOTE: the document of shipping should have been faxed over to the person collecting the goods as proof of shipment, stating which boat the cargo was on, type of goods and the date and time of arrival, so there would have been no queries at the port with officials. 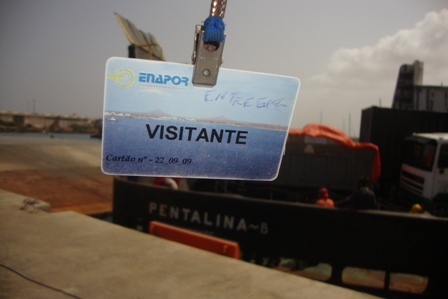 We could also have contacted Enapor on Sao Vicente or Praia by phone to check if the boat wasn't delayed or on time. If it had been an international shipment we definitely would have need all the official paperwork with us. 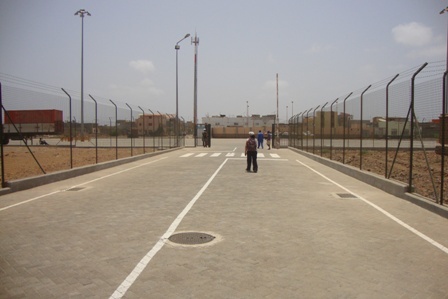 We returned to the main departure/arrival area and were told that the boat from Sao Vicente had arrived in port. We were asked to pay 60 escudos each and hand over our passports, our passport details were recorded in a book and we were then handed visitors cards, they kept our passports. We still didn't have any paperwork but gave some verbal information about the cargo. 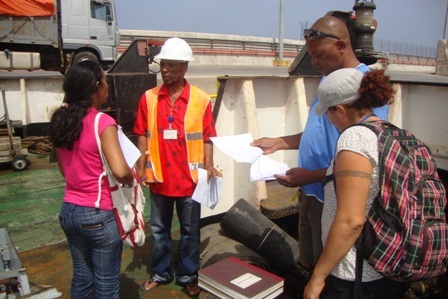 He told us we had to pay a tax for the cargo at the Enapor Office, which opened at 10a.m. 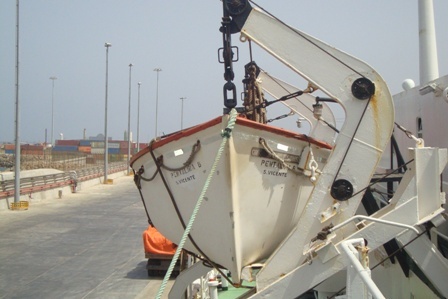 but as we didn't have any paperwork we were then told to go down to boat where we could take the document off our cargo, which we should then take to the Enapor office to pay our due's, then go back to the boat with the stamped document to show that we had paid to collect our cargo. NOTE: if the boat had been due to arrive at 9a.m. 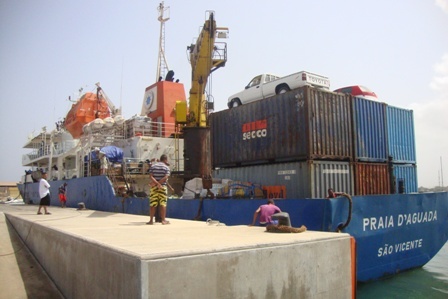 as we had been told, we wouldn't have been able to get our cargo out until the paperwork had been processed at the Enapor Office, after 10a.m. We had already made some calls to Sao Vicente to enquire with the person who had loaded the goods on the boat at Sao Vicente about number of sacks and boxes to be collected, he said 7 sacks and 2 boxes of fresh produce on the boat called 'Pentalina-B' and that the items were loaded last so then should be unloaded first after docking at Palmeira. 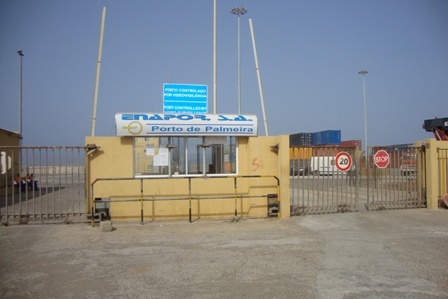 On getting past the 2nd official and through the passenger entrance of the dock gate we strolled down to the docking area and watched the boat from Sao Vicente reverse into the dock. Some people had arrived like us on foot, whilst others had arrived with trucks to pick up their goods. There is nowhere for you to buy water or a sandwich inside the port, so if you have a long wait, you could get de-hydrated and sun burned. Take some water in with you. If you arrive and wait in a truck it’s easier than on foot, as there are no areas to shelter from the sun. After the ship had docked, we’d watched the ramp being lowered, saw that one official wasn’t happy with how the angle of the boat led to the ramp not being square on, but we decided to follow a few others onto the boat to have a look around for the items we’d gone to collect. Whilst having a look around the cargo area I noticed some people with hard hats, I could understand some sense in that, with lorries that had been heavily chained, tiny spaces to squeeze through and my ignorance at walking in front of the first lorry to depart while they were raising the ramp hydraulically again and leaving me in a position where I could have ended up like a up like jam in a sandwich. The reason for the ramp being raised was because the docking engineer hadn't been happy with the positioning of the ramp and he wanted to re-align the boat. 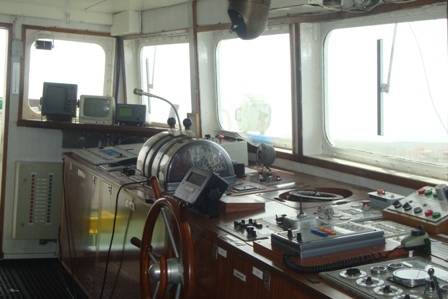 We were then approached by the second captain (that's what he called himself) as to what we were doing on the boat. It was now coming up to 11a.m. we'd had a look for our cargo items but couldn't locate them. The cargo deck was quite slippy so care had to be taken walking around in flip flops! A woman from Enapor had arrived and we could see that the our items were listed on the manifest. After approaching some truck drivers, one of whom spoke English we were informed by him that if we couldn’t see our goods then we should go find a red truck which had disembarked and had taken a number of items into the ‘park’. So off we trotted, back up to the dock gate entrance feeling really hot and dying for some water, when we got there we were told that no, any items unloaded off the boat would be brought up to the gate and unloaded there for people to collect. There was no sign of any sacks or boxes there. So, we then went to the Enapor Office, explained that we had no paperwork, she looked at the manifest and names of sender and person they were for were confirmed, paperwork processed and then to the next desk (window) to pay 320escudos tax. We then went back down to the boat. 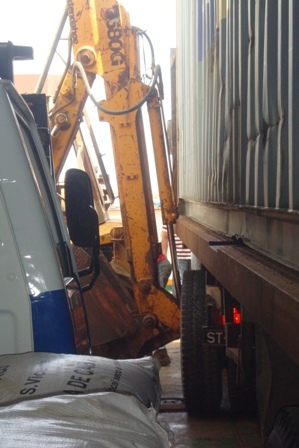 We had noticed there had been a delay in trucks being unloaded off the boat, this was due to an arm of a digging machine wedging itself into the wheel arch of a lorry, think it may have taken an hour or more to separate them without causing damage. 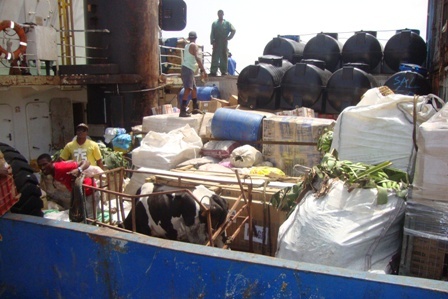 We’d also watched the boat from Praia on Santiago arrive fully laden with cargo and some passengers, there were motorbikes, water tanks, a cow and many more cargo items than what was on the boat from Sao Vicente. Again, we spoke to the 2nd person in charge of the boat, showed him our document, he took us to see his paperwork, our goods weren't listed on it, but he said there shouldn't be a problem. He then gave us a tour of the ship. We spoke to the truck driver again and he said to go back and speak to the people at the dock gate and ask them if items had gone through to 'the park'. 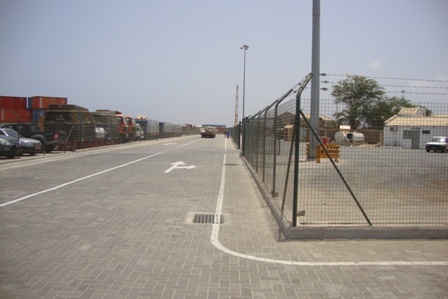 We did and, at first she said no again, then she spoke to another chap, he said no, then he spoke to another chap on a dock transport trailer carrying bananas and he said some things had been taken on a lorry (we assumed) to a parking area on the other side of the port. They pointed us in the direction of the parking area, which was around 400mtrs away. We then had a debate as to whether we should get a truck or walk down to see if the items were there, we decided to walk down. There was a truck with a container on it and some space at the back which we couldn't see into. Apart from that lorry there was only a trailer with bananas on it in the parking area. The road entrance gate for vehicles was half closed and we were called through the passenger gate. 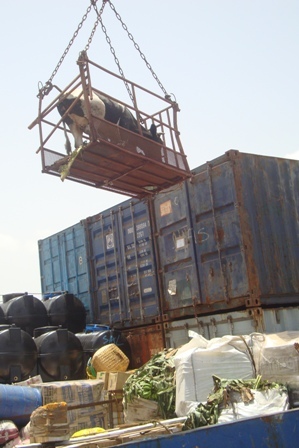 There was no-one at the lorry or container, so the person I was with had to climb up and onto it to see if the items were there, yes, finally, there they were! The security guard who had let us in came over and told the person to get off the lorry. Then some people came over from the banana trailer. A few more people started to arrive by aluger or truck via the back gate entrance. There was little help with moving our produce on the lorry to the edge for unloading, only lifting them to the ground, so that needs to be considered for heavy items. I stayed with the items while the person I was with was let out via the back gate to locate a vehicle to help us transport the produce back to Santa Maria. On finding a truck and having the produce loaded onto the back we then had to drive out of the park entrance gate, the security guard asked us all (except the driver) to get out of the truck, walk through the passenger gate, where we could get back into the truck, there was no reason that we could fathom for this, no head counts or anything! So we then drove up to the main area to show our paperwork, return our visitor’s cards and get our passports back. The driver took the Enapor paperwork to drive out through the main gate, we went back into the terminal and exchanged visitor’s card for passport. It was now 12.45p.m. A very long hot morning but we are a bit more informed after our experience.